What Do PRESTO Machines Look Like? Now that you have your PRESTO card, knowing how to use these three machines makes paying with PRESTO easier and faster. In order to pay your fare, be sure to tap the green circle on this machine every time before you ride. Listen for a beep and check the screen for a green or yellow light to confirm that your fare has been successfully deducted from your card. You'll also need to tap off at the end of each trip, unless you have set a default trip on your card. Hold your card to the Balance Checker to see your balance and transaction history. 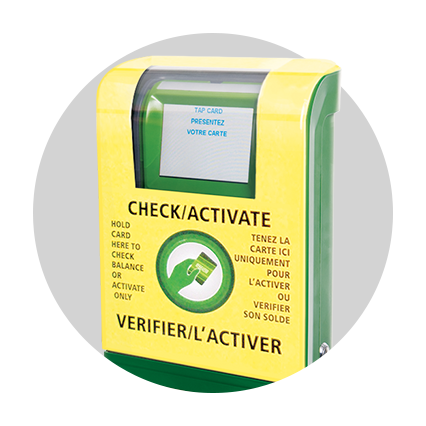 If you ordered your PRESTO card online, you also can activate your card with this machine. 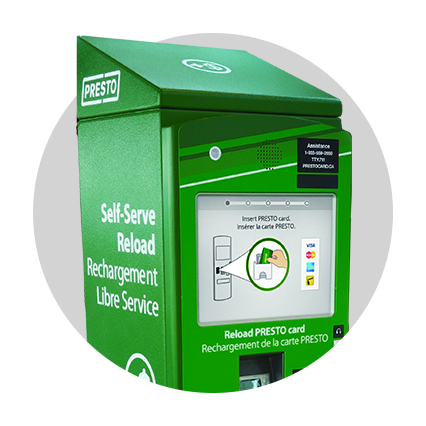 Use the Self-Serve Reload machine to load money onto your PRESTO card by using a credit or debit card. You also can check your balance and transaction. These machines are located in the York Concourse and Teamways, Bloor and Weston GO Stations, Pearson Airport, and several TTC stations. 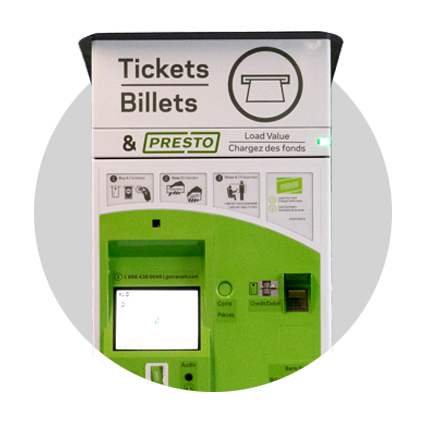 We are upgrading our ticket vending machines (TVMs) to make using PRESTO even easier. At an upgraded TVM you can load funds to your PRESTO card. You can also buy PRESTO cards at select TVMs. For additional information click here. Your tap was successful. You may also see your card balance. a Card Read Error message, it means you have a negative balance on your card. a Not Enough Funds message, it means your card does not have enough funds to pay the fare. a Blocked Card message, it means your card has been blocked. For those three messages, please visit a customer service outlet, prestocard.ca, or call 1-8-PRESTO-123 (1-877-378-6123). If you see an Invalid Card message, the Fare Payment machine believes you are tapping again within 3 hours of having started your GO trip. The Fare Payment machine will not double-charge you. Therefore, if you would like to start another GO trip, press the Override button and then tap your card. When using the Override option, you will need to tap off when you reach your destination (even if you have set a default trip). If you see an Already Tapped message, you have already successfully tapped and can continue on your trip. Travel plans changed? If you’ve already tapped on, press the correction button on the fare payment device and tap your card. Your transaction will be cancelled within 45 minutes. 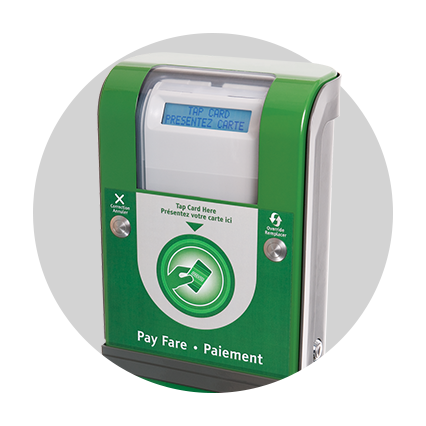 Now that you know how to use the PRESTO machines, learn to pay your GO fare easily and quickly. Click here to learn more about your PRESTO account & loading your card.